All transactions are safe and secure with a reliable history in online purchasing behind each of our associates. 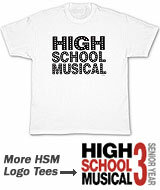 Browse High School Musical t-shirts like the HSM Zac Efron t-shirt and Sharpay High School Musical tees. What began as a Disney Channel made-for-TV movie, High School Musical quickly erupted into an international craze. The High School Musical Soundtrack rose to number one on the charts, and fans became obsessed with lovelorn characters Troy Bolton (Zac Efron) and Gabriella Montez (Vanessa Anne Hudgens). Here, we celebrate the "made-for-TV movie that could" with a handpicked selection of High School Musical t-shirts that truly deserve a bow. 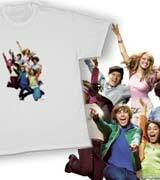 The tees include the attractive Zac Efron t-shirt and the Sharpay High School Musical t-shirt. 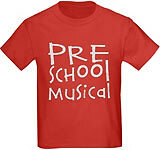 Give specified tees your own touch with customizable Disney High School Musical clothing. 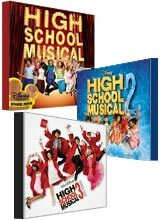 Add phrases, names, and numbers to create unique HSM merchandise. 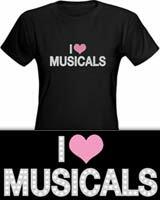 Also browse HSM costumes and soundtracks to get in on the fun. 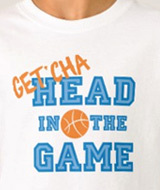 The familiar High School Musical quote on the front of this Zac Efron t-shirt is taken from the song "Get'cha Head in the Game," which can be heard on the High School Musical Soundtrack CD. Zac Efron sings lines like, "Gotta run the give and go, take the ball to the hole, and don't be afraid to shoot the outside 'J'. Just keep your head in the game." 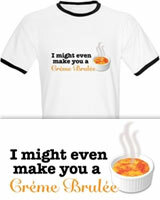 The quote is also on High School Musical sweatshirts. 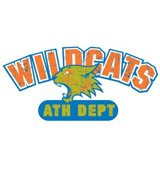 Link to: Get Your Head in the Game! 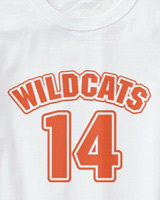 Fans of the High School Musical soundtracks will recognize the High School Musical quote on this tee. 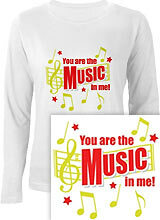 The red and yellow design features the song title "You are the Music in Me!" from the HSM 2 soundtrack. The song is performed in HSM 2 after Kelsi sings the beginning at the piano. Several other cast members join in, including Troy, Gabriella, Chad, and Taylor. While the meaning of the song is universal, it strongly eludes to the relationship between Troy and Gabriella. 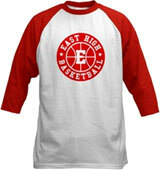 These High School Musical t-shirts are an HSM merchandise bestseller. Link to: You are the Music in Me!